Webster students celebrate Loy Krathong at the Bangkok Academic Center. Webster University Thailand students, faculty and staff gathered to join the festivities on Nov. 16 at the Cha-Am campus and Nov. 14 at the Bangkok Academic Center to celebrate Loy Krathong, a colorful Thai festival held every year on the full moon of the twelfth month in the Thai Lunar Calendar. The festival name refers to the lotus-shaped baskets that participants build and then set to float away on the water. The traditional krathong is made from a cross-section of a banana tree trunk, which is then decorated with folded banana leaves and flowers in intricate towering designs. 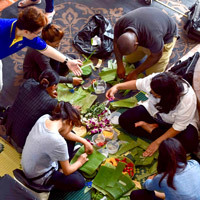 workshop to decorate elaborate krathong. Participants had the opportunity not only to learn about the cultural aspects of Loy Krathong festivities through faculty and speakers, but also to make their own krathong as part of a guided workshop. 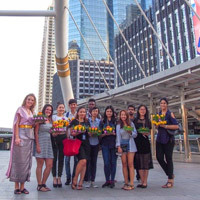 Learn more at Webster Thailand and see a collection of photos and student-made krathong in the respective Facebook albums for the Bangkok and Cha-Am campus events.